This afternoon, we attended the first hearing for the TPPF lawsuit against the City of Austin's so-called "sick leave" entitlement; two takeaways stand out. The first is that Tim Sulak is the presiding judge. Longer term readers will remember him from the 2013 Austin ISD bond lawsuit. We stand by everything we said at the time and suggest his presence is all you need to know. 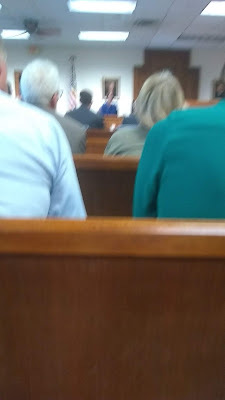 Today's hearing was supposed to cover the plaintiff's request for an injunction on the ordinance. That didn't stop the city from wasting an hour trying to get other issues considered in front of the injunction. During this discussion, the city's attorney claimed that businesses aren't suffering harm because the ordinance hasn't gone into effect yet. That level of arrogance and ignorance was the hallmark of the city's performance. Ellen Troxclair was the first plaintiff's witness for the injunction. Troxclair explained the lack of Austin-specific data accessible to council during it's deliberation. She also pointed out that council didn't have the final ordinance language available until the day of adoption. On cross-examination, the city's attorney attempted to gaslight Troxclair by asking her a bunch of irrelevant questions about her opinion of sick leave as an employee benefit. The second plaintiff witness was Douglas Rigdon, who runs the Strickland Christian School in South Austin. The Strickland school is one of the plaintiffs in the suit. Strickland is significantly less expensive than the average private school (max tuition = $5kish). Strickland's low tuition business model would fall apart if the city's ordinance were to go into effect. Ridden suggested Strickland might have to eliminate teacher bonuses, or lower cash salaries for teachers, to comply. Higher tuition is given. The city's attorneys responded by belittling Rigdon's business model, belittling tuition increases, and suggesting Strickland borrow money to cover the costs of the ordinance. Bottom Line: We'll get into the meat of the legal arguments tomorrow, but a very revealing day today.